Gravity Anomaly is a mountain biking apparel company based out of Denver Colorado that produces sewn in American items. The company was founded in 2012 by Brendan Miller, and they have been slowly releasing new products to the marketplace, including shorts, T-shirts and jerseys. Everything is interesting looking and technical, with great design ideas and materials, which provides good comfort and durability, and their made in the USA products come with an excellent lifetime guarantee. The LongHaul is their All Mountain and gravity oriented short, and has a long cut and baggy fit, and utilizes tough materials and overbuilt stitching, and has great features such as a full mesh inner liner, six pockets and a very functional waist adjustment system. The shorts are made with a tough 4-ply military grade nylon fabric with multi-panel construction, using robust double needle stitching through-out and machine bar tacks at all stress points for the utmost in durability. For saddle maneuverability and comfort, they utilize a seamless gusseted crotch design. Internally, it has a softly padded waist band, and a 100% Polyester vented micro-mesh liner, though it doesn’t include a chamois. The shorts have a zipper fly with a two-snap closure and a waistband with D-ring adjustable Velcro straps located along the sides. 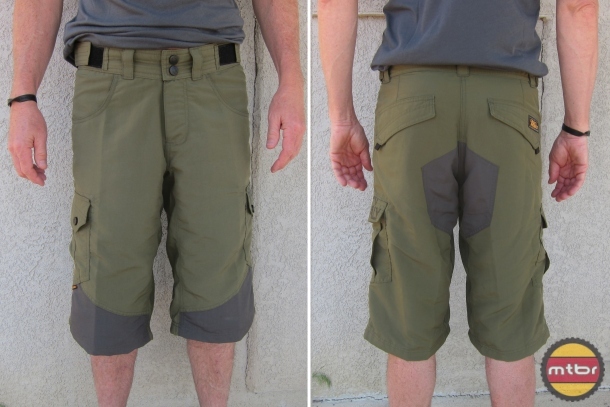 They have two-front cargo pockets, two thigh pockets with snap closures and two rear pockets with Velcro tabs. They come in olive (tested) and charcoal colors, four sizes (S, M, L & XL) and retail for $85. 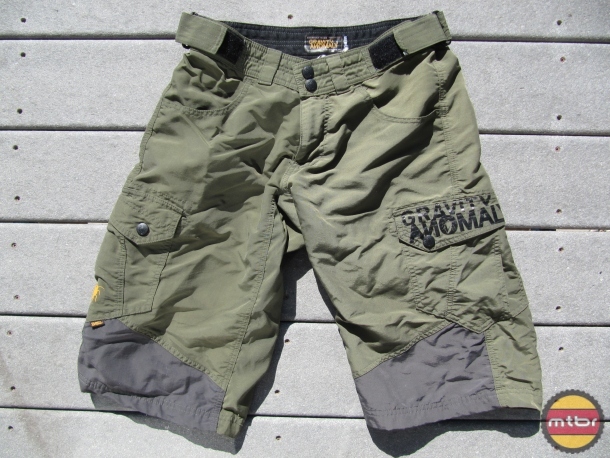 Continue reading for more on the Gravity Anomaly LongHaul Shorts and full photo gallery. I have these! The review is pretty spot on. I love them. They instantly change your look from dorky XC spandy-spinner to steezy Enduro pro. They have velcro cinchers on the sides to cinch them tight, or expand with your beer gut.